The e719Sd offers a 43.2 cm (17") diagonal in the classic picture format 5:4. Delivering a high typical contrast of 1000:1 and a fast pixel response time of 5 ms only, this monitor from the Professional Line is perfectly suited for standard office applications such as text editing, web browsing or e-mail correspondence. With 250 cd/m², the e719Sd delivers enough luminance to also be used in environments with bright ambient light. Via D-Sub or DVI-D, contents can be displayed in SuperXGA resolution. Thanks to its energy-efficient LED-backlights, the e719Sd fulfils demanding sustainability certificates such as EPEAT Silver and Energy Star 6.0. 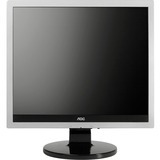 AOC equips the monitor with intelligent software to further reduce power consumption. Let the e719Sd impress you with its qualities!